We have had an interesting winter so far. The first half has been mild, with periods of heavy rain. 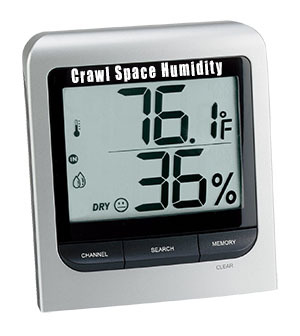 Elevated crawl space humidity levels and dew points were common inside crawl spaces well into December 2015. With 11 inches of rain falling in November, many homeowners have been complaining about standing water inside the crawl space. Recently, we have transitioned into a much cooler and drier pattern. Crawlspaces are beginning to dry out, and the surface soils are shrinking back to a more normal state. 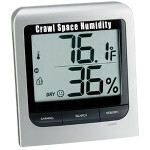 These crawl space humidity extremes may be causing changes to the foundation supporting the floor system. As the wood members lose moisture, localized shrinkage of the floor joists, girders and sub flooring also occurs. Doors may stick and cracks may also appear over walls and door frames. Any structural flaws that are present inside the crawlspace such as improperly shimmed peers and/or over spanning issues may become more obvious as the humidity drops. Creaking, popping, nail pops and other multiple visible symptoms of distress may also be reported. To have this problem properly diagnosed, and a solution developed, the specialist needs to be an expert in structural wood repair and crawlspace science. It is critical to be able to understand how seasonal moisture spikes and periods of dry affect a foundation. Crawlspace air quality being at the center of any proposed solution. For more information on this please feel free to contact me, Michael at Masserang Contracting and Consulting – your independent, crawlspace professional.